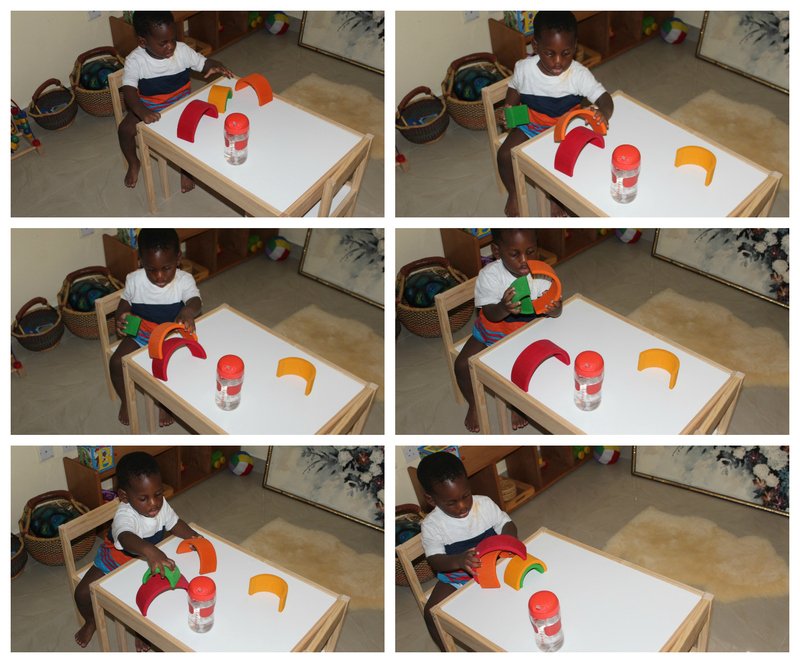 I think it’s great to see wonderful pictures of Montessori children working and concentrating. Sometimes it looks so perfect and can be intimidating. Today I wanted to show you what work/play sometimes looks like in our house so that you realize that yes, there are plenty moments of perfection but there are also plenty wonderful moments of imperfection. So I was folding laundry in my son’s room while he played. 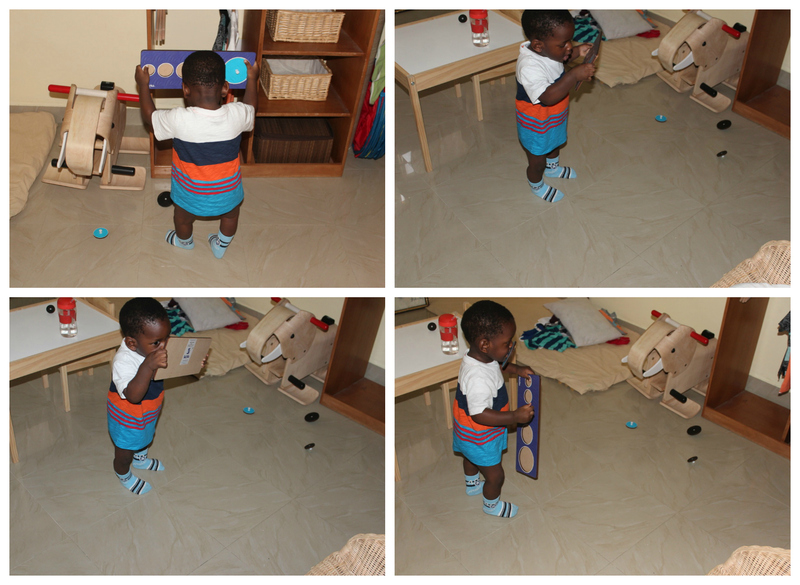 He has had this rainbow toy in his room since he was 3 months old and he plays with them but on this day he really engaged differently. I thought this was cool so I decided to observe and take pictures. 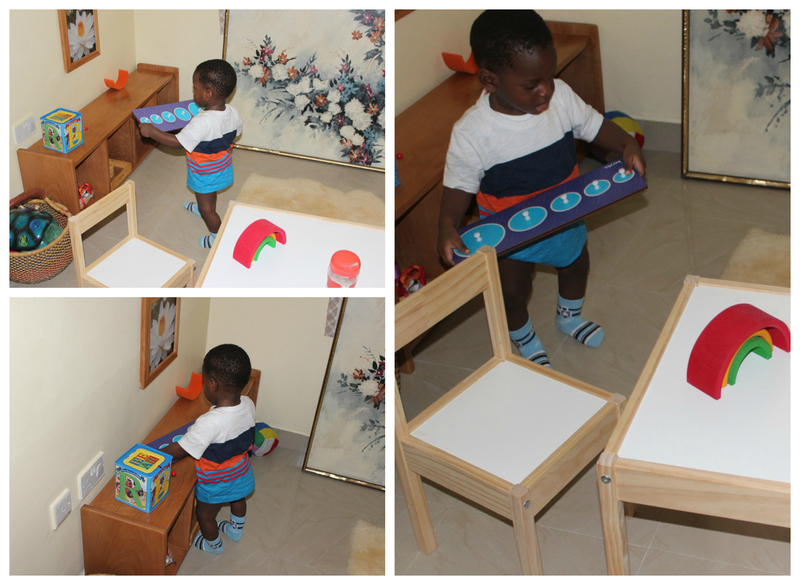 He really concentrated on this and tried to stack and arrange them in different ways… I was impressed. 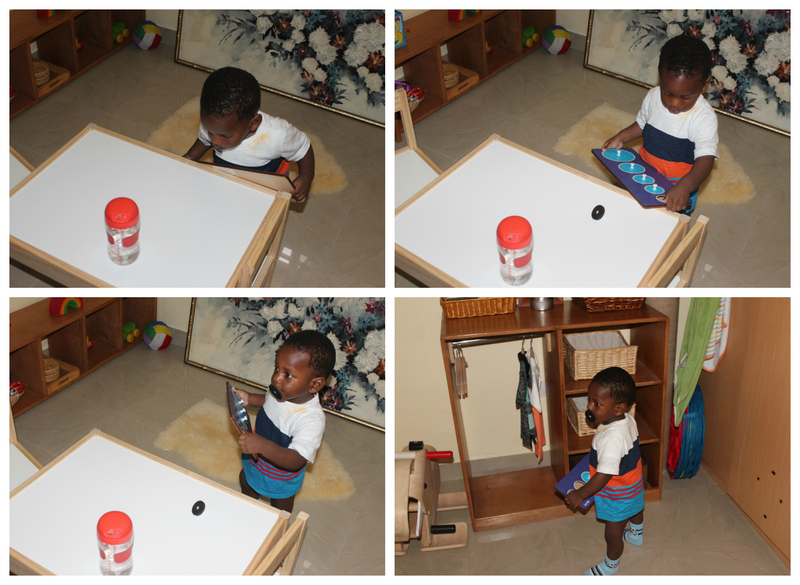 Most times when working with materials with multiple pieces, when he is done, he picks a piece or two and walks around with it till he is ready for something else. 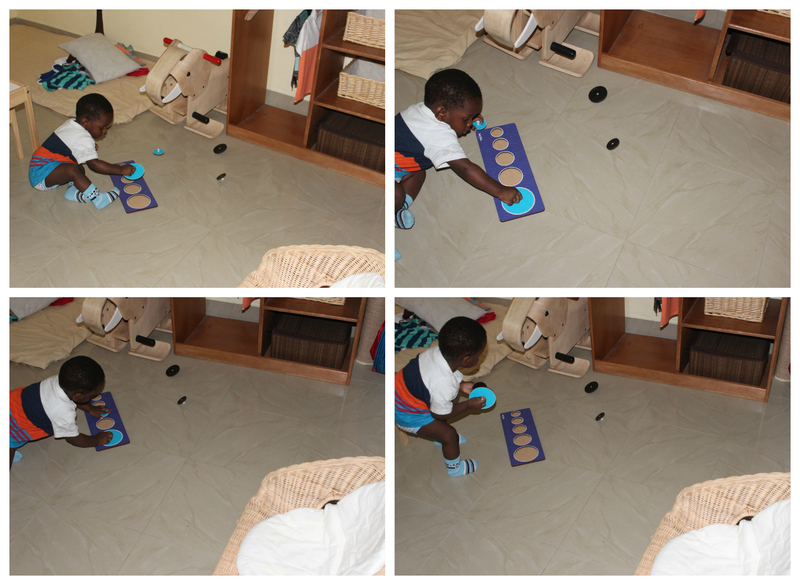 In this case, he took the orange piece and first played with his music box and then moved on the puzzle. He put it down and then carried the puzzle to the table. I was thinking… cool! Even though he did not take the rainbow back, at least he brought the puzzle to the table. 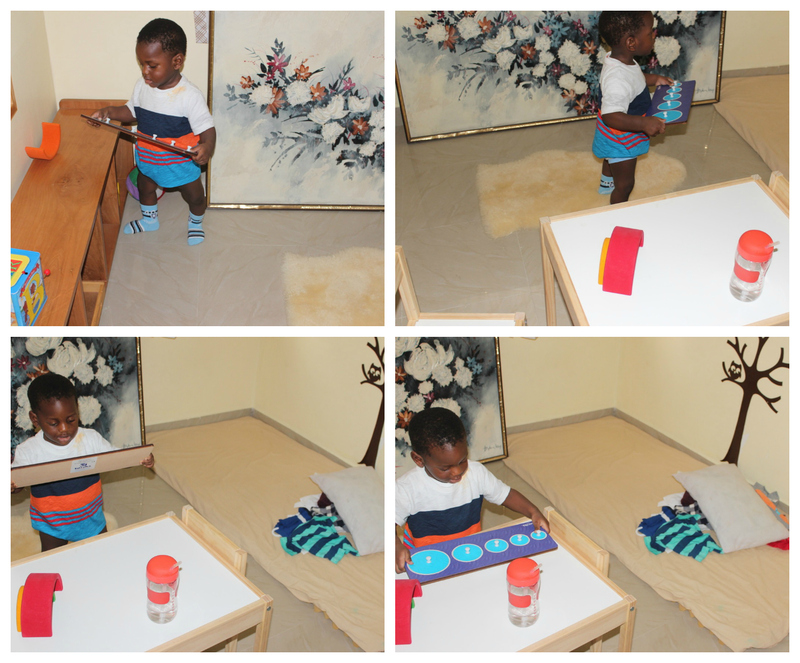 He then picked it and returned it to the shelf and brought it back again… ok? Maybe he is practicing carrying it? And then this happened! 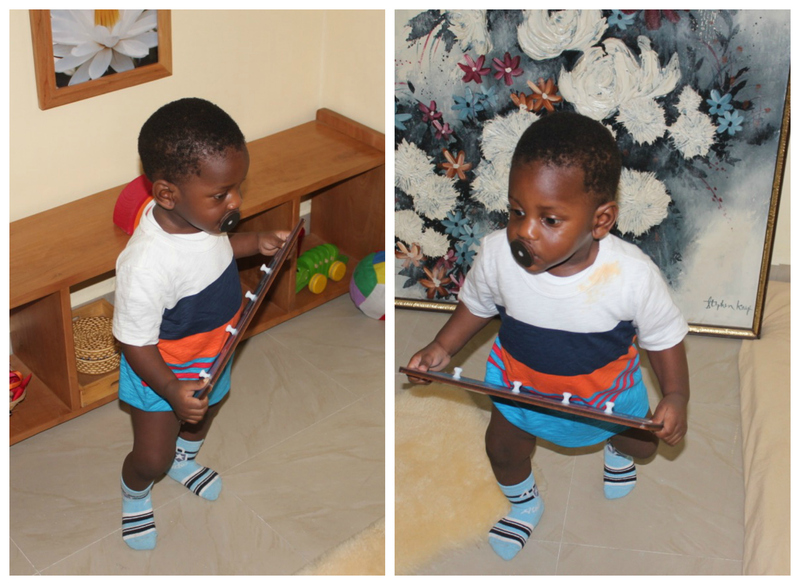 He picked one of the pieces with mouth… no, he has never had a pacifier before. 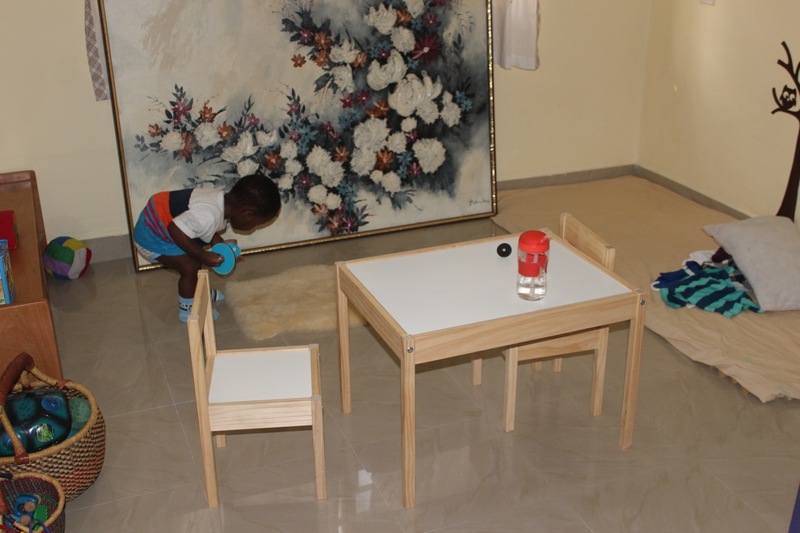 He put the piece on the table from him mouth and picked another piece with his mouth. Ok? Maybe he is inventing a new mouth transfer game? But no, he did not drop the second piece… He decided to walk to his closet area… I’m still watching. 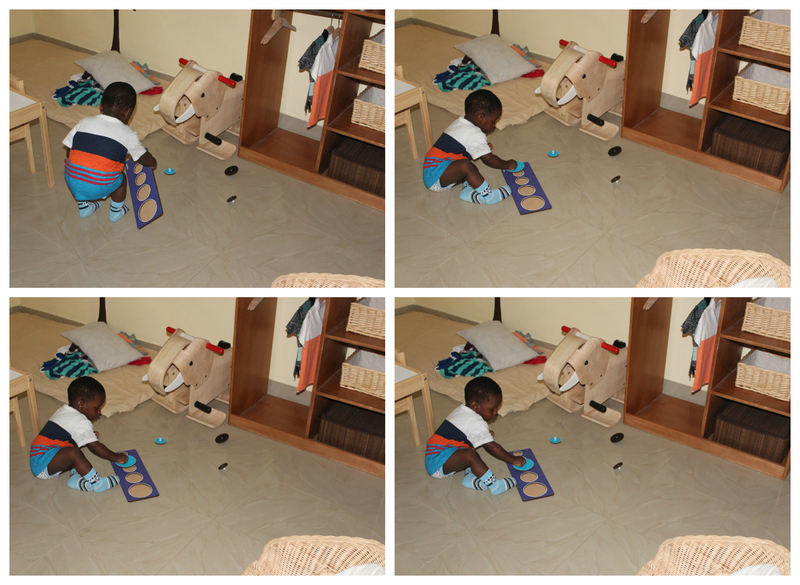 He then lifts the puzzle over his head… ummmm???!!!! There’s one piece that doesn’t fall so off course, he picks that piece with his mouth. He then puts down the puzzle, sits and tries to fit the piece that was in his mouth. I hope you found it as funny and comforting as I did. Posted in UncategorizedTagged Keeping it real, Montewhat? “Respect all the reasonable forms of activity in which the child engages and try to understand them.” As you so well do and help us to as well, thank you. Thank you Jeanne-Marie. It’s so hard to do sometimes but so rewarding for both child and adult when we do. I found this hilarious! Kudos to you for not interrupting his movements!